… so following on my from my previous Christmas Gift Guide post, where I confessed that although I seem to want masses of clothes all year round and yet, at this time of year, I tend to hit a bit of a blank. A more frugal shopper that I would have have been noting stuff down as they spotted things for a “wanted list” and then, as the Black Friday / Cyber-weekend of discounts hit, would have blitzed her list and bingo: job done. Everything except one item. An item which I have wanted for years now. However, either I haven’t found the right one, or I’ve bought one in haste and it’s ended up being not quite right… The Parka. 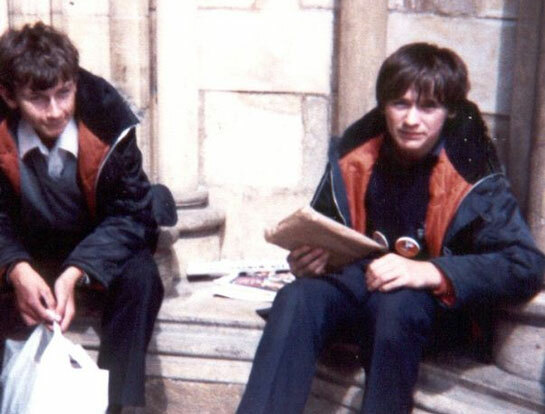 I have hankered after a good parka for 40 years now; I was 5 years old when my 8 year old brother got his classic navy parka with orange lining back in the 70s. I was a tom-boy at heart, but unfortunately for me, my mum loved to dress me in her own handmade pretty frocks but inside: I was massively jealous of my brother’s parka! Since the 70s, Parka’s have come in and out of fashion until eventually, the love for a good old Parka simply wouldn’t subside and they have become a classic coat, and frankly a wardrobe staple for parents watching their kids from the sidelines of various sportsfields all over the country every Saturday and Sunday morning. They are also a *must* for most dog walkers as well in my opinion. 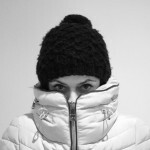 So why has it been so hard for me to find my perfect Parka when there are so, so many around? Well, aside from the obvious sizing problem I have, I also have “hood issues” in that, having once owned a Parka with a detachable hood, you come to realise that your hair gets tangled in the zip attaching the hood to the coat which unzips frequently, even if you don’t want it to. Or indeed, if it’s buttoned on, the button holes loosen up and again, you wind up getting strangled by a half detached hood hanging off to one side. Then there is the fur trim issue: I love the look of the fluffy fur, but in reality, I really, really dislike it when the fur gets wet. And of course, the ‘filling’ of the coat: there are some gorgeous, gorgeous down filled Parka’s out there, but as I live in the South of England and not the Arctic, some of the Canadian Goose filled Parka’s are actually just too puffy and too warm – even for a cold blooded lizard like me! I understand that the fluffy fur trim and detachable hood and just being shower resistant are perfectly acceptable requirements for others, and that it’s really just me who is being mega, mega-picky… but I guess in listing my issues it shows you just why I’ve had such difficulty in finding “the one”. Last Tuesday, I met up with a friend in Basingstoke – a half way point on the train line between where we both live. Neither of us had been before, but the station was close to a whole bunch of restaurants as well as the shopping centre. We had a great day, mainly drinking coffee and eating but did have a little look around the shops. Love the short fur lining & that the hood is permanently attached and its warm without being too puffy and properly waterproof to boot! In-store I tried this on in a size extra small which was far too roomy on me; in fact, when I tried it on *over* my leather biker jacket, only then did it fit. At £119.95 & with the cyber weekend looming of course I didn’t buy it there and then, plus, GAP do a size XXS, and so thought I’d check online for my correct size. The first thing I looked up when the 40% Black Friday codes hit my inbox was this coat and bought it in a heartbeat. I was rather chuffed with myself because by Saturday, the Khaki Green was sold out online and is now only available in “snow cap” – basically, white. 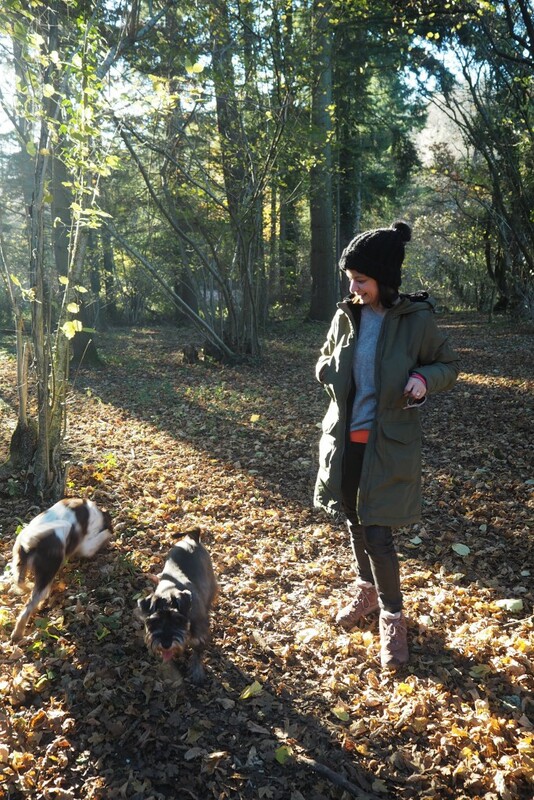 If you are probably wondering why I’m even bothering to blog about this Parka if its sold out online…? Well, let me tell you – there are tonnes of them in-store. And yes, the 40% discount codes may be over for now, but GAP always have discount codes knocking around and frankly, the Christmas Sales are a-looming just around the corner… and this Parka is definitely worth the full price, let alone the £71 + some pennies which I paid for it. 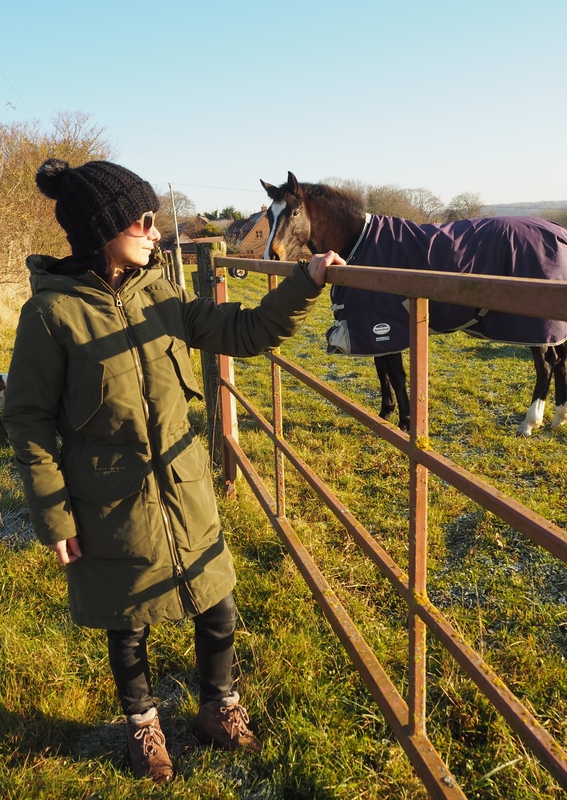 The Parka features “PrimaLoft” which is “the luxury alternative to down” and claims to “look like down, feel like down and warm like down” and after receiving it yesterday afternoon, I couldn’t wait to put it to the test this morning. 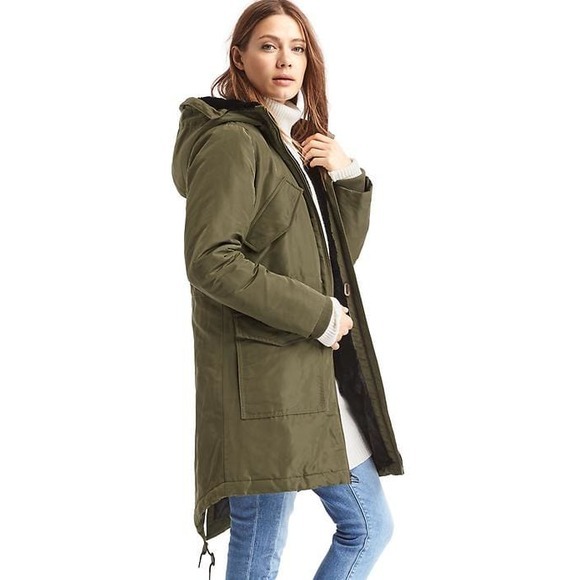 Now this Parka, though a size XXS, isn’t a “petites” coat which you can see from the length on me compared to the first image of the model wearing it: however, this extra length is on my side on this occasion as it will keep my legs warm right down to me-knees! And the two way zip means I can leave a little opening at the bottom so that my I’m not restricted when walking. Some of the reviews online of this coat complained that the top pockets were too high, but frankly, aren’t these pockets meant to be slightly too high on a Parka? That’s what I remember of my brother’s original 70s Snorkel Parka. 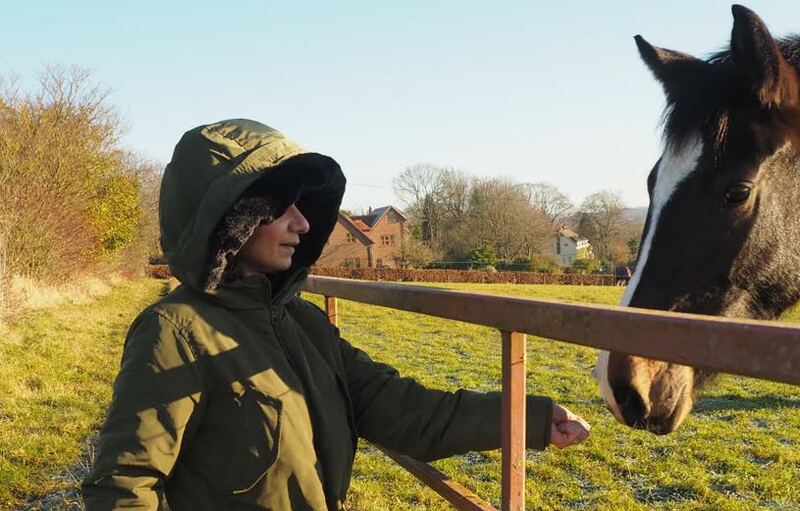 Here, I’m pretending I’ve got a sugar cube as I wanted a photo with the horse… I felt a tad guilty with my empty hand! Well, it’s a close up of the hood, to show you the short fur detail… its meant to be rolled over on the edge of the green outer, but I unfolded it for this photo just so you could see the fur more clearly. Also I’m really happy that there’s no zip or buttons attaching this hood as these can often end up being more of a hinderance and to be honest, if its not raining and I don’t want a hooded coat, then I’ll wear a coat without a hood?! I really was on an actual real dog walk, not just posing with horses!! 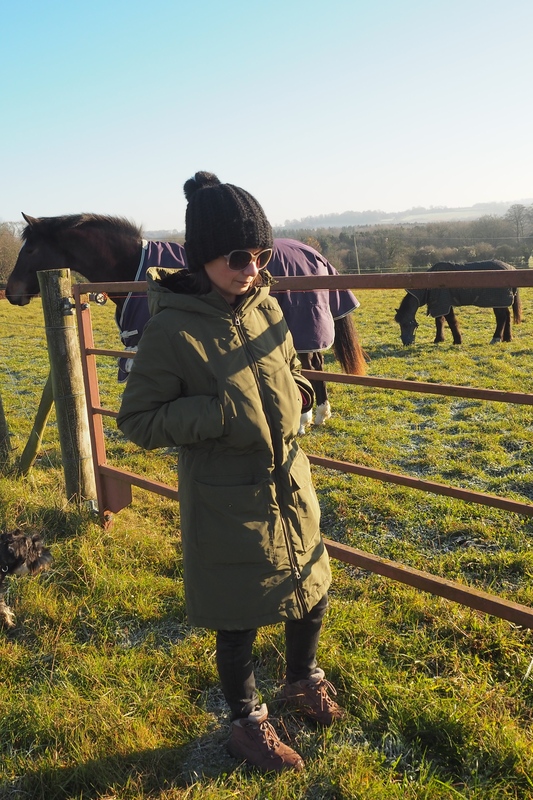 Having walked through frosty open fields and then the shady woods this morning for a little over an hour, I can confirm that this Parka is the biz! It’s not just warm, its cosy and comfortable – even for driving in. Some of my ‘puffier’ coats can get rather annoying and bunched up under the arm when driving – not this one! I’m really, really happy with it which is why I’ve postponed what I had planned to blog about this week – to next week, just so I could share my parka-love with you all. 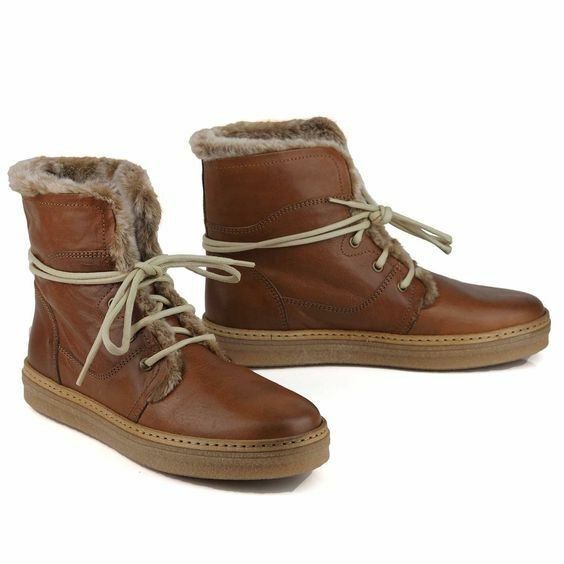 These Tan Leather Gloria boots are now also available in black leather as well. But alas, these cost even more! £185. 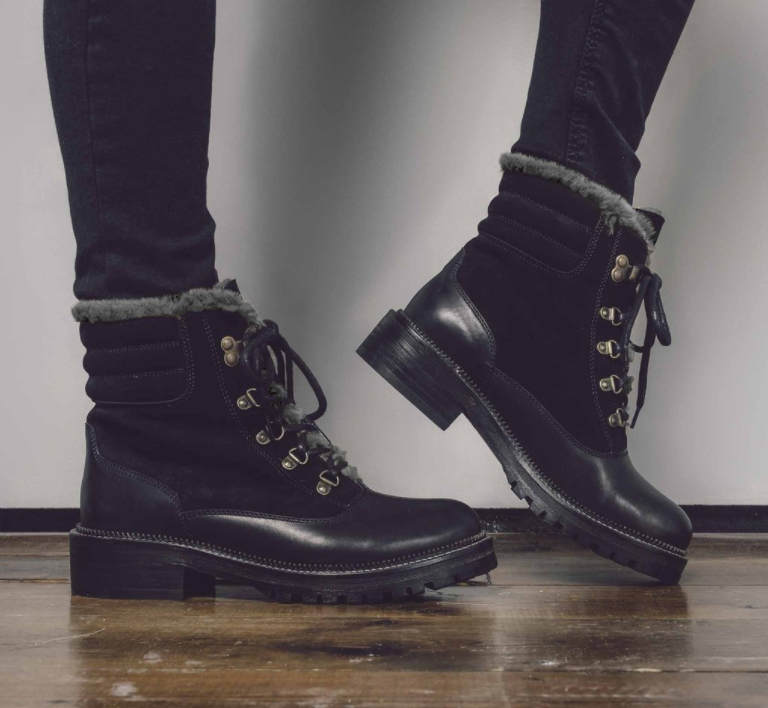 I’m just going to have to stick with my old walking boots which I bought from an online outlet some 8 years ago for the princely sum of £12.50. They’re not anything to write home about but they are warm, and do the job just fine, although yes, they are kind of heavy, so they do make my right knee a little achy if I wear them for too a longer walk as I did today. BUT… like I said… Christmas Sales are just around the corner: so watch this space. 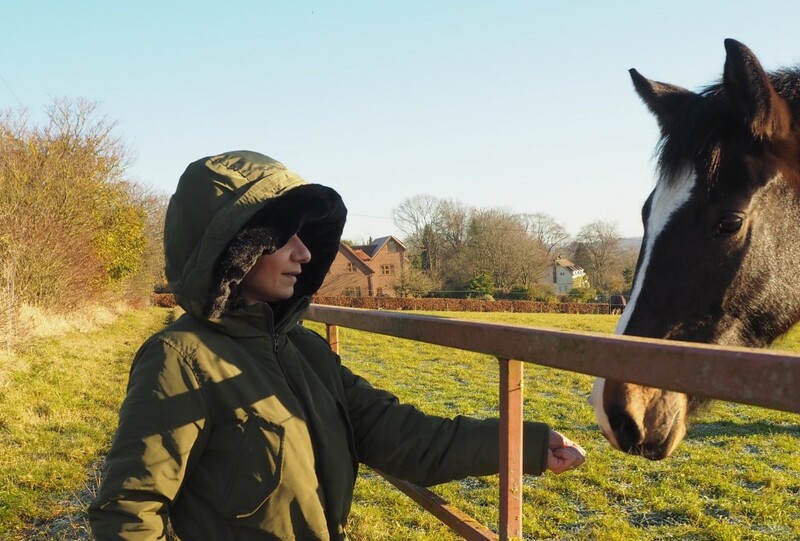 Til then, would love to hear your thoughts on Parka’s… are you as fussy as me, or indeed the opposite of me and love the detachable /fluffy fur hood thing?